SOCHI, Russia (AP) — Swedish hockey captain Henrik Zetterberg will miss the rest of the Sochi Games because of a herniated disk. "What he's going through right now, it hurts just to watch him," Olympic and Detroit Red Wings teammate Niklas Kronwall said after a 1-0 win Friday over Switzerland. "He goes through more than most people just to be able to play." 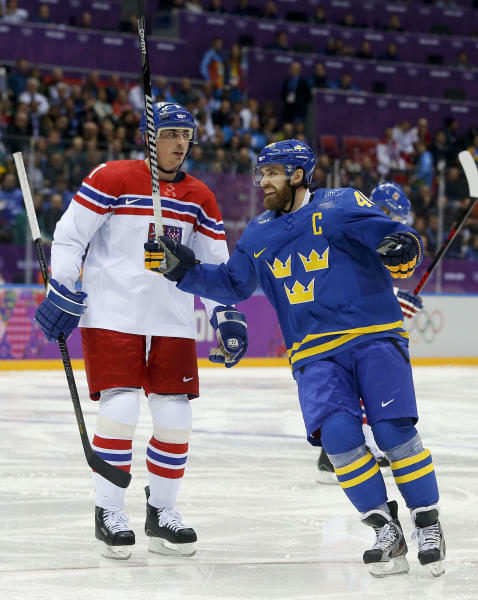 Zetterberg played through pain and scored a goal in the Swedes' opening victory over the Czech Republic on Wednesday, but sat out of Thursday's practice because of his back injury. "It is so painful for him that he can't be in it anymore," team doctor Bjorn Waldeback said. "It is Z who has taken this decision together with me. I think it is the cumulative load. There was no specific thing that happened in the game. The issues came the morning after. These are nerve-related issues and they often come creeping in. It is not one specific injury." The Detroit Red Wings captain had anti-inflammatory treatment and consulted with the NHL's doctors in Sochi. "(The NHL doctors) totally agree with us," Waldeback said. "When you suffer from a herniated disc the way he does, you need to go home for a medical evaluation." 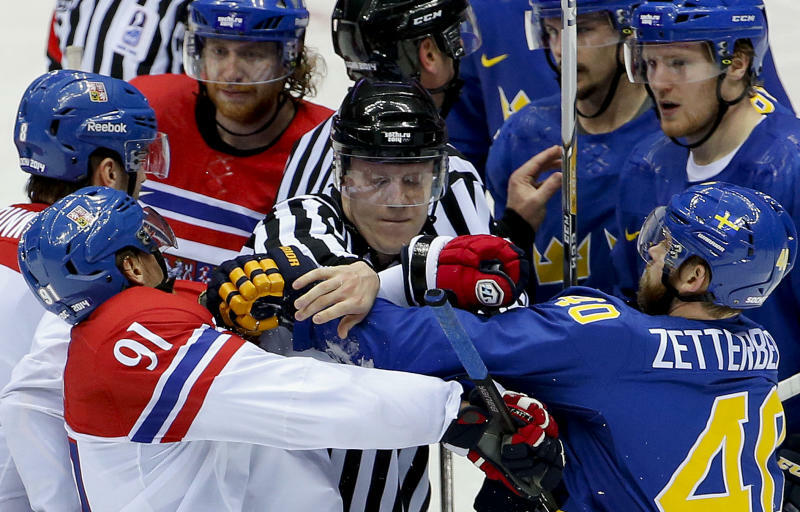 The four-time Olympian's absence is another big blow to the Swedes, who were medal favorites before forwards Henrik Sedin and Johan Franzen also were forced to skip the Olympics with injuries. "I spoke with Z on the evening after (Wednesday's) game and he didn't show any signs of feeling the slightest pain," Swedish head coach Par Marts said. "Of course it's nothing one wishes for, but we have to see the possibilities and look forward." Sweden still has ample offensive firepower, but depth and shifting lines could be a problem when the elimination portion of the tournament begins next week. Sweden can't replace the 33-year-old Zetterberg on its 25-man roster, which is locked after the teams' first game. Henrik Sedin pulled out of the Olympics recently with a rib injury, and Franzen was unable to travel to Sochi because of a concussion. Defenseman Niklas Kronwall, Zetterberg's teammate in Detroit, replaces Zetterberg as Sweden's captain. Zetterberg is headed home to Detroit and might need surgery, which could seriously impact the Red Wings' postseason hopes. Detroit is fighting for a playoff spot in the Eastern Conference to extend its postseason streak to 23. The injury also has bothered the Swedes' first-line center during the Red Wings' season, forcing him to miss 11 games. He has been in and out of Detroit's lineup in recent weeks. Zetterberg won a gold medal with Sweden in Turin in 2006. He has scored five goals in his four Olympic appearances.